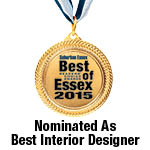 Residential interior designer, Richard Bailey, is among the top choices in the category of Best Interior Designer by Suburban Essex Magazine. The design firm is based in Glen Ridge, N.J.
Richard Bailey Interiors, LLC, a high-end residential interior design firm in Glen Ridge, N.J. has been nominated as Best Interior Designer in the 2015 Best of Essex Readers’ Choice Awards. The award is a much-anticipated annual event sponsored by Suburban Essex Magazine; readers submit their nominees to the upscale lifestyle magazine in a range of categories. Online voting takes place from July 1 - September 30 and is open to all community residents. An anticipated 20,000 magazine subscribers will vote in the 2015 event. All categories award a first, second and third place honor based on number of votes. “It’s gratifying to know that the quality of our work and attention to detail are so appreciated by our clients,” said Richard Bailey, principal and lead designer of the full-service design firm. Richard Bailey Interiors works throughout the U.S. with discerning homeowners who seek its designers’ elegant interpretations of traditional through mid-century designs. The firm often incorporates custom-designed draperies, carpeting and furnishings. To contact Richard Bailey Interiors call 973-429-2106 or email info(at)RichardBaileyInteriors(dot)com.